The kiddos and I had planned on going to visit my sister and her family in Southern California during Christmas break this year. But as things sometimes go, our planned trip just isn't working out. So I find myself faced with the idea of entertaining four kiddos over their Christmas break. In our society, so much emphasis is placed on "go, go, go", "do, do, do", and "spend, spend, spend". It seems like life is all about being complicated. 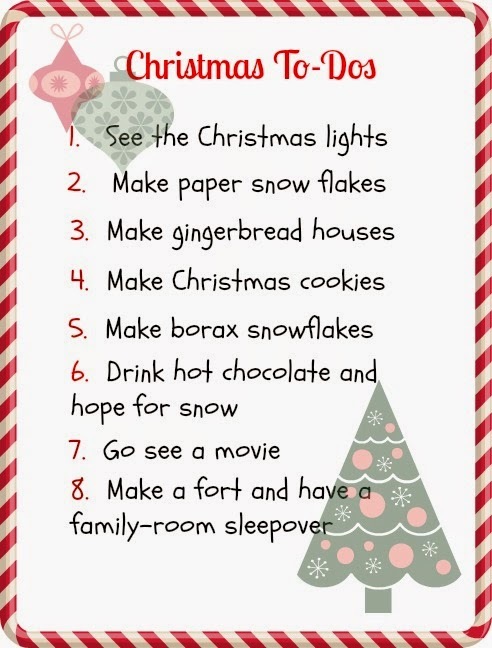 So I sat down with the kids and made a list of things we could do over Christmas break that would be simple and fun. I love some of the ideas we came up with and thought I'd share them with you. Except for going to see a movie (which gets costly with 5 of us) all of the ideas on our list involve minimal expense. And I make sure we go see matinee movies to minimize the movie expense as well. None of these ideas are extravagant. None of them involve much (if any) technology. They're just ways to enjoy one another's company during the holidays. One of my goals for this coming year is to simplify our life. I don't know about you, but sometimes I feel like I run myself ragged trying to make my life Pinterest and Instagram worthy. And I worry that in doing so, I'm not setting such a great example for my children about what life should really be. Of course, I want our home to be lovely. And I want my kids to feel cherished. I don't think that means that everything we do needs to look like it comes straight from the pages of a magazine. And so I'm making a bit of change. I got to thinking...my book is called Decorating for Real Life. I want to make this blog about real life. I still want to inspire...I just want to do it in a "real" way. So on this little blog, I'd like to share ideas that are realistic. That don't cost a fortune. That are attainable. I hope this will resonate with you, my dear readers. Won't you join me? I'm with you on the real life part. Wishing you and the kids a great Christmas and only the best for the New Year.